Are You A Serious Cigar Smoker? Can you be a serious cigar smoker if you don't have a humidor (exceptions will be made for those that cannot yet afford one)? Furthermore what about a lighter or cutter? In other words, if you are serious about cigars you are also serious about tools and accessories. Your humidor must be maintained at the right temperature and humidity. You lighter must use a high quality butane to prevent bad taste and light the cigar properly. The cutter must be sharp or the head of the cigar could be ruined and diminish the draw. The accessories of a cigar smoker reflect our passion for the leaf and now the same applies to fashion. If you are a serious cigar smoker you need a Leaf&Barrel cigar shirt. Are you still carrying your cigars in a zip lock bag, two finger, or herf? Are you also carrying a wallet, car keys, mobile phone, bill fold, lighter, and cutter? That's a bit much. Where there is passion there is fashion and the most passionate people that I know are cigar smokers. Much like sport enthusiasts that don the clothing of their favorite teams and bikers that wear biker gear while riding, cigar smokers now have fashion made to enhance the cigar smoking experience. Leave the zip lock bag at home, walk into the lounge wearing your Leaf&Barrel cigar shirt, select one of the cigars and enjoy. 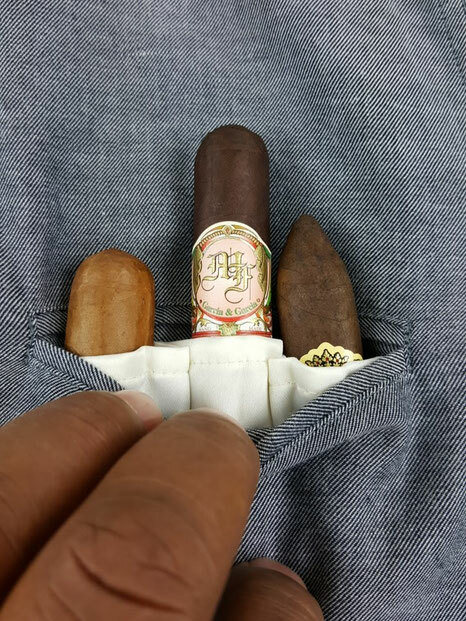 The pockets are designed with individual slots that prevent the cigars from rubbing against each other. Their also made with fabric that does not breath which will keep your cigars fresh and there's a front pocket to hold your cedar spills. This is a shirt made for smoking! **All Leaf&Barrel shirts made in America from Japanese woven cotton.